Beef and Beetroot curry is a variety dish with pleasing flavours, a complex mix of spices, tender beef pieces and earthy, colorful beetroot. This uniquely flavoured dish is an absolute favourite from childhood. 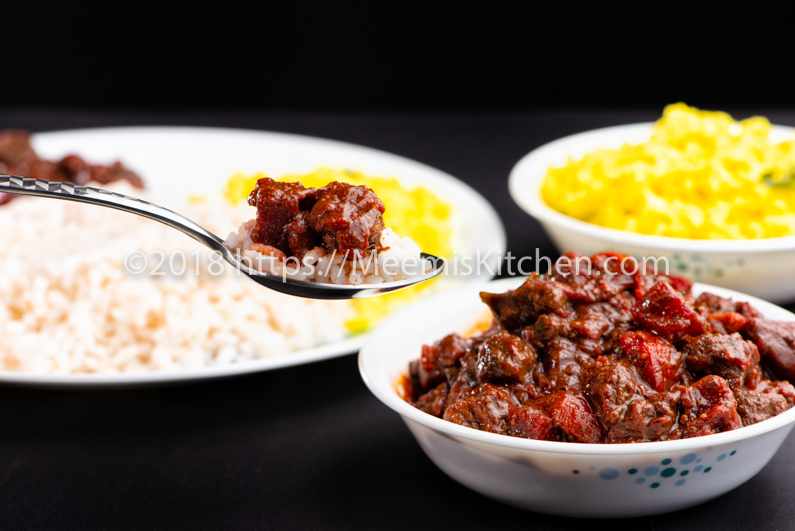 Beetroot and beef curry is a wonderful combination of Beef and Beetroot; a vibrant, colorful and a delightful dish to have with rice. My grandmother was quite an expert cook and would come up with these unique combinations like Chicken with potato, Meatball curry, beef with Chakkakuru (jackfruit seeds), Beef with raw Banana, Pork Koorkka curry etc. These innovations were necessary at that time, as she had to feed six hungry boys. But for her grandchildren, this is a family dish, with so many nostalgic memories. Beef and Beetroot curry is a particular favorite of mine – the aroma, the vibrant flavours and color all are extremely tempting! For all Beef lovers, this is a perfect treat like Kappa Biriyani / Ellum Kappayum. Most people might think that it is an unusual combination like my Fish in spicy Cabbage curry, stir fried Beef with mushroom etc., but it is extremely flavourful. 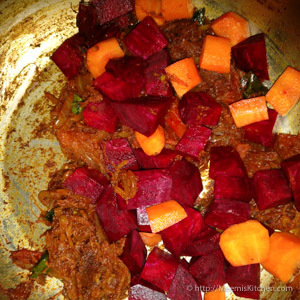 This unusual combo is very popular in South Asian cuisine, where they puree the beetroot to make it more colorful. Once you try this Beef with Beetroot and carrot curry, you will be making it regularly. In Kerala, you will find different combinations with Beef like Beef Kappa Biriyani, Beef / Pork Koorkka (Chinese Potato) curry, Beef and Kaya ularthiyathu etc. Beef fry, Beef ularthiyathu, kerala Beef stew, Meatball curry, nadan Beef curry -all are popular beef dishes for Kerala lunch. My recipe for Beef and beetroot curry is a Kerala style preparation, with variety spices, herbs and chilies. Hope you will love these nadan preparation, like Nadan Chicken curry with Thengakoth, Pork pepper fry, Kerala Mutton stew, Chicken roast, spicy fish curry etc. It is advisable to eat red meat moderately, so it is better to add vegetables with beef to reduce the harmful effects. I have added carrots as well in this curry to balance the spiciness. I strongly feel we should eat everything that we like in moderation rather than deprive ourselves the happiness of relishing on certain food we like. Life should not be a struggle to impress others; rather enjoy each day, doing good and spreading love and joy around and always be grateful to God for His love. Coming back to our recipe, this humble Beef and Beetroot curry is a perfect dish to add spice to rainy days! Hope you will enjoy this family recipe, which I learned from my darling mom. Dedicating this recipe to my wonderful family members in Kerala, who can relate to this dish with the same nostalgic feel. Stay blessed! Pepper Powder : 1 tsp. Small Onion : 5 nos. Wash and clean Beef pieces and drain well. 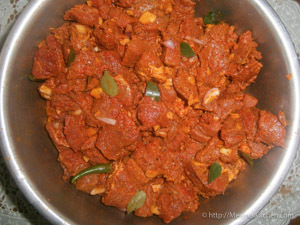 In a pressure cooker, mix beef pieces, salt, sliced small onion, chopped Ginger, Garlic, slit green chili, curry leaves, half of the beef masala and vinegar. Combine well and pressure cook the beef and keep aside. Peel the beetroot and carrot skin, wash and cut into cubes. 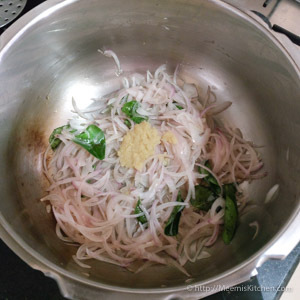 Heat Coconut oil in a pan and fry thinly sliced onions and curry leaves. Add Ginger Garlic paste when limp and sauté for few minutes. Next, mix in the rest of beef masala. Fry for a minute and add cubed tomatoes and fry again. Now, add the cubed carrot and beetroot and sauté for two minutes. Mix in the cooked beef, with water and adjust the salt. Add little more water if you prefer more gravy. Pressure cook till two whistles and serve with rice and thoran. Coconut oil should be used for best flavours and taste. While cooking beef, do not add water, as it releases enough water. Cooking time required could vary according to your pressure cooker. Usually it takes 8 minutes or little more on slow flame after the first whistle. It should not be overcooked. Beetroot and carrot require less cooking time. One to two whistles in pressure cooker would be enough. Cooking beef twice makes it softer and tender. 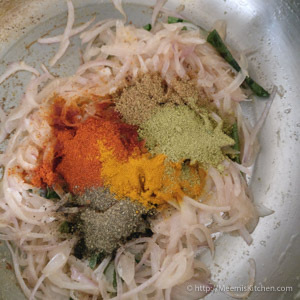 Check the link for Garam Masala – “How to make Garam Masala at home” for best results. Enjoy with rice, Pulissery, thoran or with Parotta / Roti. 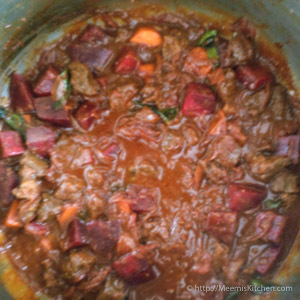 If you like this Beef and beetroot curry recipe, please share with your friends using the share buttons on the side or put in your comments. I will be happy to see your comments. God Bless! !